Thanks for the post. I hope everything turns out OK. Family more important than any weather stuff. rb, best wishes and hope everything works out with the family situation. Latest guidance seems to suggest 2-5" inch kind of deal for Sunday night/Monday morning. Something else to watch next weekend too in terms of more snow. Unreal. I may just get to the 70" mark yet. I may cry uncle. Scott how’d you do? The threat that is being supressed to the south would be for Sunday Monday ish. That actually does look like that will happen BUT as we haver all seen we will look for the NW trend as we get in tight. How far ehh I dont think we have to worry but well see. jmanley32 wrote: I'll check in on the 5th as we know this yr nothing has really shown till 48 hrs or less. Like a blood hound I love sniffing out the faint odors of a snow event. Ray, Frank, Mugs, Bill etc and the rest of the NJ Strong crew were all over it. You've been great all year Doc but didn't you and Jim Morrison put an end to winter several days ago? Loved the song but hated the implications and the zonal flow behind it. And then there’s that 18z GFS from dawn Saturday into Monday morning. Yep, 12z GFS still on it for next Sat night and Sunday. 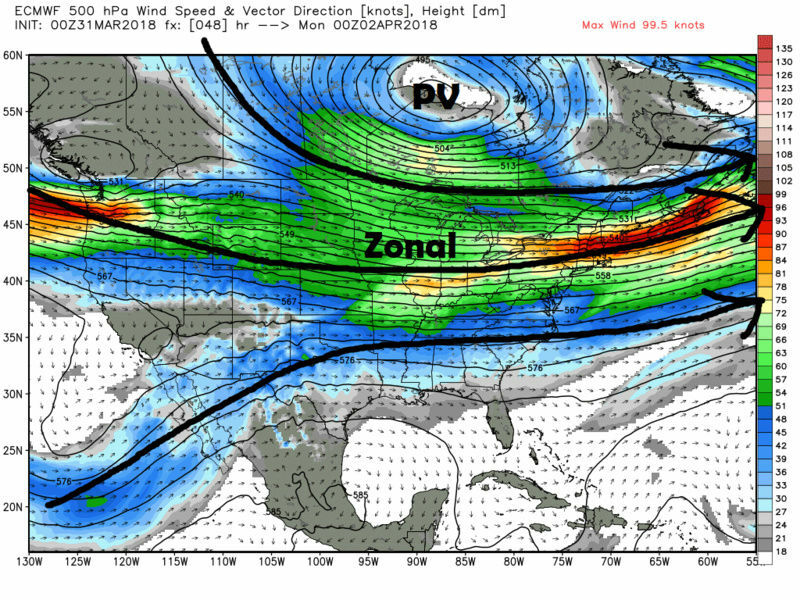 Scott we have an Archimbault event in the making as I see it for next weekends Nor. ear lord 12z GFS!!! 2 feet + N & W and godzilla even into NYC, thats insane. CMC on board for a areawide gopdzilla next weekend too, what does Euro show? 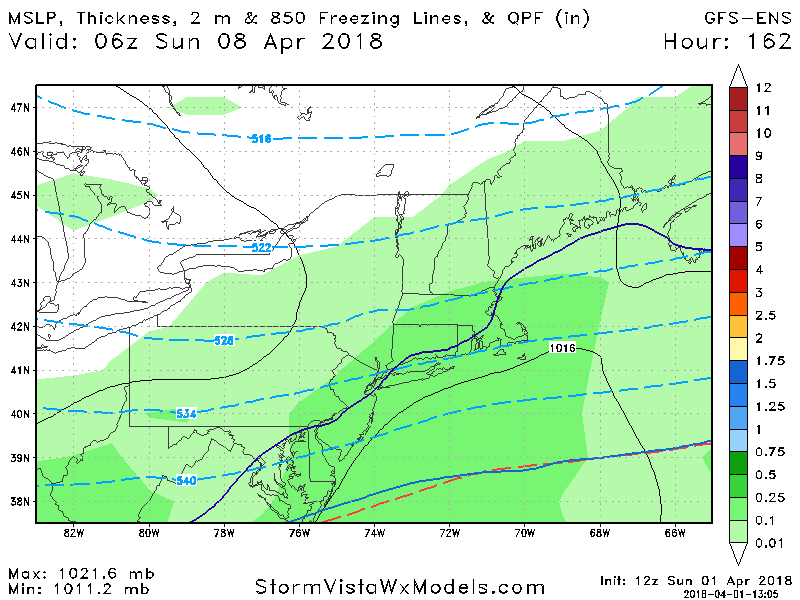 Euro has the coastal storm too but further off the coast on Sunday I think. Although the fact that the GFS comes further north and closer to the coast is what causes the mixing issues for many so a track slightly further south and east could make things snowier - if it doesn’t stay toooo far S&E. Right where we want it for next weekend. One model west; one east. Perfect. I’m a little saucey. Happy Easter friends. Waiting to get a full look at the 18z run. But right now it is continuing (as it has been for several days) to intrigue me. Yep 18z GFS still has a major snowstorm Saturday night through Sunday. Lol. 6 days of model shifting to go but it’s been relatively consistent the past two days with this. If this storm pans out it would be very heavy wet snow even inland, this would dwarf the last one in terms of power outages, would be very serious. April storms of that magnitude are not good in that respect. jmanley32 wrote: If this storm pans out it would be very heavy wet snow even inland, this would dwarf the last one in terms of power outages, would be very serious. April storms of that magnitude are not good in that respect. Yeah a foot of heavy wet snow would be problematic even without winds but this could produce some wind as well. Other thing is, God forbid some trees start to bud this week branches could be heavier. billg315 wrote: Yep 18z GFS still has a major snowstorm Saturday night through Sunday. Lol. 6 days of model shifting to go but it’s been relatively consistent the past two days with this. Wow, the pattern that just keeps giving! It's been an amazing stretch since March 1.My only wish is that this snowy stretch had happened during that extreme cold we had in December-January.Not complaining.